Click here to see an article in The Economist about the extraordinary results achieved with this training. McKinsey, Accenture, Skanska, WPP, Save the Children, Reed Elsevier, British Airways, WPP. Procter & Gamble, The PGA, KPMG, O2, Siemens, Bank of England, Marks & Spencer, Boots, Barclays, Tesco, Sainsbury, Saatchi, J&J, Mindshare, GSK, London Underground, NSPCC, Novartis, Mars, BP, Diageo, Shell, Cadbury, The UK Cabinet Office, British Olympic Association, The World Food Program, and Unicef. In a crisis, most perform brilliantly. But afterwards, many slip back down to a business-as-usual performance level which is way below the level they show in a crisis. Learn to access your in-a-crisis capability, without the need for a crisis. Many people nowadays are trapped in back-to-back meetings and conference calls, constant messaging, and always-on-screen. Some now see it as an achievement, even the goal, just to keep up with the hour-to-hour. Instead learn how to make the time and space to create the extraordinary. It’s easy to come up with ways to make things a little bit better. And we stay trapped in this because the usual alternative of blue-sky brainstorming produces little. Instead learn the techniques to generate big powerful ideas that can be made to work. IF YOU FIND IT DIFFICULT TO SPARE 2 DAYS TO INVEST IN YOUR CAPABILITY, THAT’S EXACTLY WHY YOU SHOULD. 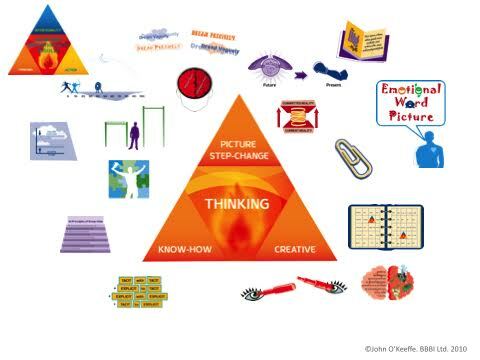 New strategies to generate the level of THINKING, ACTION and INTENTIONALITY needed to get extraordinary results. And new tools for each to help put the strategies into practice day-to-day. On THINKING, the top 3 elements to focus on to generate big but practical thinking, and avoid the drift to daily reactive thinking. On ACTION, how to differentiate between action and hectic activity, and the three ways to generate truly bold action. 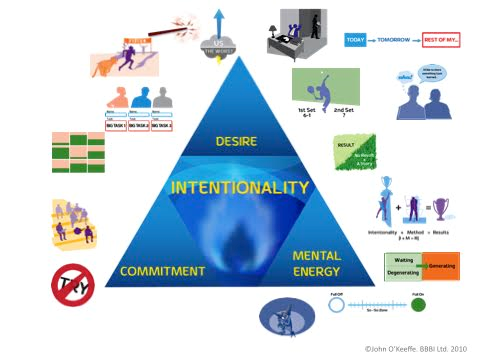 On INTENTIONALITY, how to strengthen that needed mixture of self-motivation, determination and grit not to quit, which others consider an untrainable character trait. How to build your personal intentionality. Learn lessons from your behaviour in a crisis – when we’re all in the same boat, it’s all hands to the pump, and we collaborate with others in an extraordinary fashion… because we have to. A special bond is formed. A highly intensive, fast-paced 2 day masterclass. The design is a breakthrough in itself, to cover material normally covered in a typical 5 day course, so saving you 3 days. 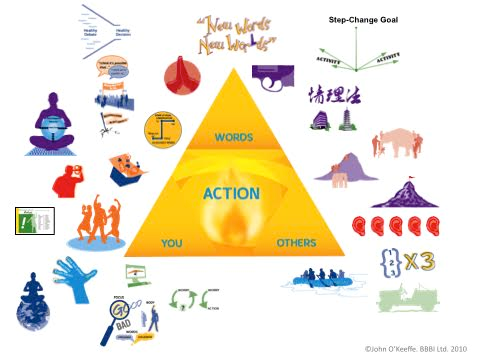 It does this by eliminating the fat of most courses; replacing unproductive long breakouts with frequent, focussed, powerful interaction; uses multiple short but real business examples to illustrate points powerfully; employs many simple, practical short exercises for participants to learn by “doing”. The focus is on learning new “tools” as well as strategies. Managers can typically agree new personal strategies in theory when away from work, but find it difficult to put them into practice when faced with the hectic daily routine. But they will readily try tools, and if they work, will continue to use them and so change behaviour on the job. a) a 40 day project to make a real step-change. b) a personal recipe of tools they plan to put into practice to help achieve it. Too often, people leave a seminar enthusiastic, but with no follow-up and find it difficult to apply what they’ve learnt. They get sucked back in to the daily routines. BBB includes unique, individual, follow-through telecoaching over the next 40 days to help each participant put their personal plan into practice. Why only 40 days? Experience shows if you haven’t used a tool by then, you never will. On the other hand, the tools work, and it only takes a first experience for you to want to build them into your armoury. Working with one of the world’s leading franchisers (KFC) we have created programmes that are ‘Best-in-World standard for both Train the Trainers, and Train the Coaches. This allows companies to cascade broadly and quickly for maximum impact on results. John O’Keeffe is the founder of BBB. He designed the programme drawing on three sets of experiences with high performance. At 19, while studying for a Masters in Chemical Engineering at Cambridge, he became an International hockey player, and spent 2 years in the Olympic Programme. He learnt early what it takes to aim to be Best-in-World. He then had a fast-track career with P&G through marketing and general management, developing and putting into practice the tools he now teaches. He reached the level of Group Vice-President, and a member of P&G’s Worldwide top 20 Executive Committee. He had a best selling book on achieving breakthrough results whilst still at P&G, called Business Beyond the Box. Working with one of the world’s leading franchisers (KFC), he has created programmes that are ‘Best-in-World’ standard for both Train the Trainers, and Train the Coaches. This allows companies to cascade broadly and quickly for maximum impact on results. Click on the button below to find out about the next public programme.